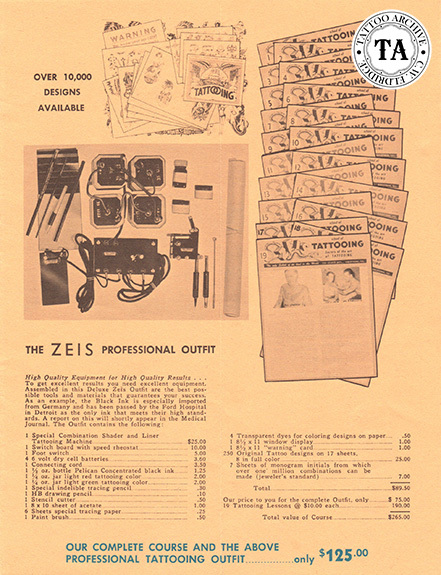 Undoubtedly the most famous tattoo school in the history of tattooing was the one Milton Zeis assembled in the 1950s. This twenty-lesson mail order course was accredited by the state of Illinois and many old-time tattooists often mention this course in interviews; sometimes with disgust. Tattoo suppliers always included some sort of written instructions with the equipment they sold. 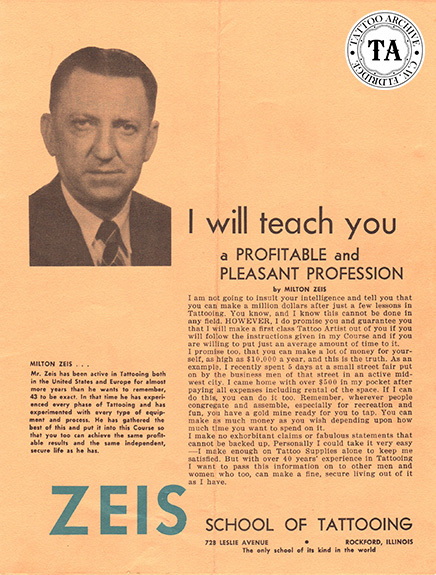 The Zeis home study course was just an expanded version of the written instructions offered by Percy Waters three decades earlier. Has the time come for tattoo schools to move into a more respectable position in the tattoo world? For decades tattooists with less than stellar reputations have operated these schools. As a matter of fact, tattoo schools were an ongoing joke in the business. The old rub went, "those who can't tattoo -- supply or teach." More often than not, these school were viewed as get-rich-quick schemes where sizeable fees were collected and little was given in return. This was before tattoo magazines, the Internet, MTV and new state government regulations. That is to say, before the tattoo world changed. The popularity of the starter kit and the lack of apprenticeship opportunities have filled the ranks with artist/operators who don't have a full grasp of the bigger picture. Starter kits don't come with instructions on safe health practices, an autoclave, history lessons or a moral compass. Are we creating a generation of tattooists ill-prepared for the modern world? Today many state legislators are looking for a way to update antiquated health codes, licensing processes and fee collection methods. Oregon has instituted a policy requiring a course of study at a licensed or accredited school, approved by the Board of Education, before issuing Oregon residents a license to tattoo. There are at least 20 such schools teaching tattooing in the state of Oregon. Is this the wave of the future? Is this what it will take to have our art form grow? Or is this just the latest incarnation of apprenticeship mills that have been around for years? Sure, some of these schools will be better than others, that is the case in any line of study. How will these tattoo school graduates be measured? Back in the day a young tattooist's potential was measured by whom they learned from. Could the day come when that potential is measured by which tattoo school they graduated from?